Another year, another impacted area and another crop of willing BCIT students. Throw in some funding, equipment, materials and supplies. Mix liberally with Tom Biebighauser and we have the recipe for another successful wetland restoration/construction project. See “Golf Balls and Wetlands” posted on this blog April 28, 2014 to read the history of our project and partnerships. 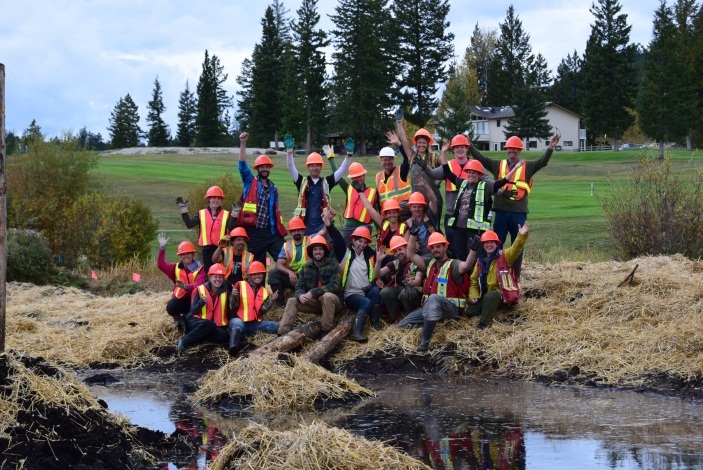 The Meadow Creek Golf Course at Logan Lake was once again a hub of activity and the site of another week-long outdoor classroom project hosted by the Logan Lake Enhancement Working Group (LLEWG), the District of Logan Lake and the Meadow Creek Golf Club. Twenty-five students and staff from the 4th Year Ecological Restoration Program at BCIT, an extension student from Saskatchewan and LLEWG members were put through their paces by Tom. In September 2014, with generous funding by the Habitat Conservation Trust Foundation (HCTF), we worked in roughly the same area as we did in 2013, upstream of Logan Lake. 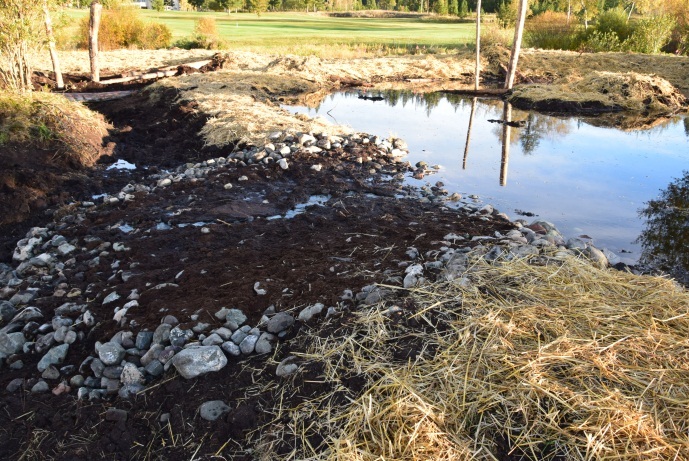 The plan was to create a larger wetland complex with 3 basins (see Before & After photos above). Tom led us through a full day flagging the area, surveying elevations, digging soil pits and going through the logistics of the site. Monday morning arrived with the excavator on site and us anxious to see what it would encounter. Tom explained to Shane, the operator, what he wanted done. He then explained the workings to the group which led to questions and feedback, which in turn tweaked the plan for Shane. This occurred throughout most of the day. As this part of the project was going more smoothly and quickly than expected we decided to ramp up the outdoor classroom value – divide the class into 3 groups and have them plan and design their own separate wetlands downstream. Nervousness gave way to excited planning chatter, surveying, flagging and digging soil pots as each group immersed themselves at their site. Once the excavator work was complete at the larger complex Shane then moved to the first student site. He was a perfect fit for working with an inexperienced group as he was very patient and open to discussing their plans and ideas. Tom, of course, was the overseer posing “what if “ questions to guide them when required. It was amazing to see “light bulb” moments, the group taking ownership of “their” wetland and working together as a team. The second group encountered a great clay layer, perfect for sealing the bottom of their wetland. 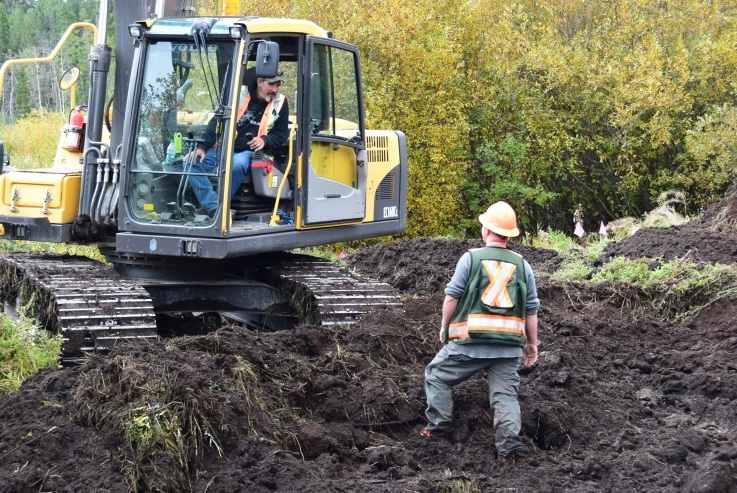 The third group was getting anxious as time was marching on and we weren’t sure that we would get to “their” wetland with only 4 days of excavator time. Shane worked efficiently and breaks were short. We made it! Each group put their own touch on their site; islands with log bridges, deeper/shallower basins, a snag on a knoll sporting clay wildlife, utilizing native seed that that group harvested locally instead of the commercial seed mixture and of course group photos at “their” wetland. The smiles and high fives were definitely evident and talk about the “best fieldtrip ever” really made the week for instructors and organizers. A technique used a lot this time was the installation of grade control structures. A lot of rock, tamped into the ground with the excavator bucket, was laid between each basin in the large wetland complex and the outlets of the 3 student wetlands. The streamflow in this area is minimal but can still produce headcuts and erosion if the soil substrate isn’t stabilized. The photo of a grade control structure shown here, has peat on top of the rock. This low pH material will help lower the high pH water (a water quality improvement). Constructing a project on a golf course has a downside; unless you are staff or a golfer access is restricted due to flying golf balls and liability issues. We made arrangements for Thursday afternoon, a timeslot when the course could be cleared, to invite the public and also bring a herd of goats onsite. We were anxious to have an opportunity for the local residents and others to see what we were doing and the goats just added to the educational factor. Rocky Ridge Vegetation Control, a BC company that raises and uses goats for weed control, was working in the Logan Lake area. We made arrangements for them to graze on the upland around our 2011 and 2013 wetlands. This experiment took place as the area has a lot of invasive plants, especially Canada thistle, due to the removal of organic soil from the natural wetlands 28 years ago and our opening up of the seedbank with wetland restoration projects. We have tried various methods of environmentally friendly invasive plant control in an attempt to stay away from herbicides and this was the next step. 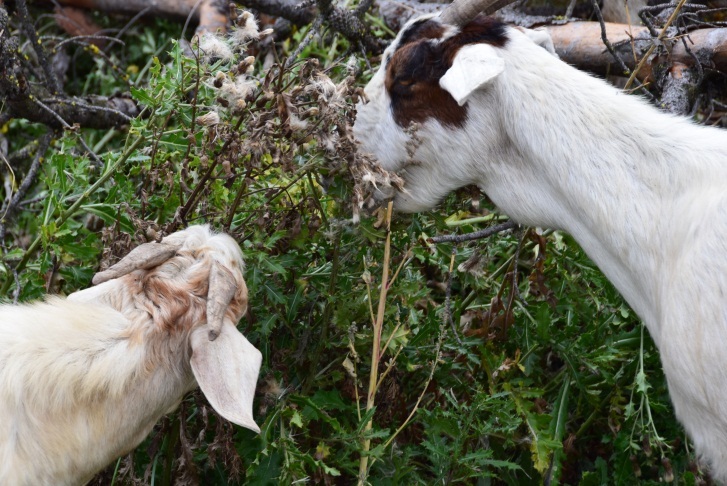 Goats are utilized for weed control as they are one of only a few animals that loves to eat weeds and the fact that they have a complete digestive system means the seeds they eat are not viable in their manure. Two riders on horseback with 5 dogs moved 248 goats to the site. It was quite interesting for the students and the public to watch! When all was said and done at the end of the day we had a chance to assess the results. We quickly realized that there were too many goats for the small site with more vegetation trampling than eating. The goats were stressed from being pushed and confined as they were not allowed to wander at will. They certainly did eat thistle but also the willow and our nursery plants. A nice try but not quite the results we were hoping for. Our wetland experience in Sept 2014 was the best our partnership groups have experienced in the 3 years that we have been together. Another funding application has been submitted to HCTF and if successful all parties will be returning for another week of wetlands in Sept 2015. A huge thank-you goes to the students and instructors from BCIT, Tom Biebighauser and to the Meadow Creek Golf Club for making it the success it was. We are all looking forward to what Sept 2015 will bring! Happy group upon completion with Golf Course and Club House in background.